Breathing techniques, focus, and exercise to improve overall health & happiness. 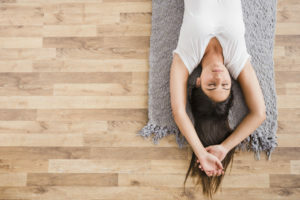 Targeting deep connective tissues, a Yin Yoga pose is formed by slow movements and held for three to five minutes. Your instructor will guide you to find your “edge” and then settle in. Participants will stay in poses allowing tissues to respond to slow, sustained holds. Poses are mainly on the floor and encourage relaxation. Music will include nature sounds and will mostly be instrumental. Be “Yinspired” and try this progressive form of yoga! This class will include elements from the many styles of Hatha Yoga. Your instructor will emphasize alignment, flow from posture to posture, a series of poses, and holds for four or five natural breaths. Intensity will vary throughout the hour. This well-known style will include favorites such as Mountain, Cat & Cow, Forward Bend, and Triangle Poses. The music will include a mix of upbeat popular favorites to old school tunes. Pay attention on purpose, and be present in the moment. Focus on breathing while sitting or lying flat. Blankets and props are welcome. This practice will allow you to quiet the mind and relieve the negative effects of stress from your day. Your instructor will provide soothing sounds/music and occasionally narrate guided imagery scripts.